Titanic Alley – One of a kind bow ties, handmade from select reclaimed fabrics in Columbia, SC. Titanic Alley celebrates the bow tie. Named for an early 20th-century community that was located in Columbia, SC, it is the inspiration for a line of handmade bow ties. We use only high-quality reclaimed fabrics – cottons, linens, wools and silks – to create a look that will enhance your casual or dress attire. From formal to whimsical, our one-of-a-kind bow ties exhibit a commitment to the local artisan/maker movement, green practices, and the expression of unique individual style. 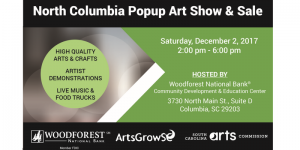 Saturday, Dec. 2, 2:00 – 6:00 p.m. – North Columbia Popup Art Show & Sale, 3730 North Main Street, Columbia. Hosted by Woodforest National Bank with the South Carolina Arts Commission. 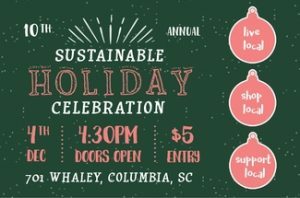 Monday, Dec. 4, 4:30 – 8:30 p.m. – Sustainable Holiday Celebration and Market, 701 Whaley Street, Columbia. Hosted by Sustainable Midlands. 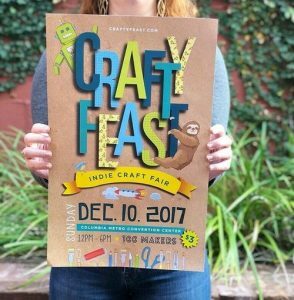 Sunday, Dec. 10, 12:00 – 6:00 p.m. – Crafty Feast Indie Craft Fair, Columbia Metropolitan Convention Center, 1101 Lincoln Street, Columbia. If you’ve read this far, here’s a little reward. Head over to our Facebook page, like us, and scroll to find a special discount offer available only to our Facebook friends.